R and I had been dating for many years before we got married. Our conversations used to revolve around our families, our lives together, our cultural differences, amongst many other things which young dating couples from different cultural backgrounds talk about. 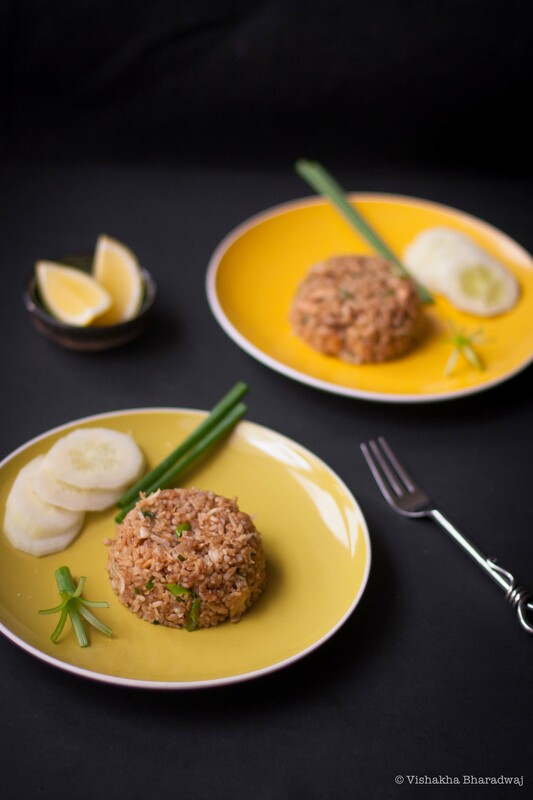 R’s family is from West Bengal, a state in the Eastern part of India that is often known for its politics, literary history, culture, a daily diet that MUST include fish, and people who are extremely fond of sweets! My family, on the other hand, comes from the neighbouring state of Bihar, a state that is often the subject of conversation for its politics, lawlessness and poverty. The harsh reality is that we live in a world of stereotypes. The only silver lining is that we also live in a world where travel has become a lot easier and internet ensures there is enough information for people who seek out for it. This is definitely helping people to see beyond these stereotypes. Before I got married, I was only worried about how I was going to deal with the sweet palate of the Bengali family and relatives because I definitely didn’t have one. It would be rude to refuse a sweet offered so lovingly and generously. Fortunately, it wasn’t really as difficult as I had made it out to be. Word spread about my love for fish and my lack of appetite for sweets. The rest is history. I have been fortunate to have some of the best food in many Bengali homes. No restaurant can match up to that taste, variety and depth of flavour that is created in these home kitchens. My Mother-in-Law is one of the best cooks I know. I owe a lot of my understanding of Bengali food to her. There are also a couple of other relatives and friends who have wholeheartedly welcomed me in their kitchen and given me the opportunity to watch, ask questions and learn. That learning over the years has given me the confidence to cook a lot of traditional Bengali food at home. 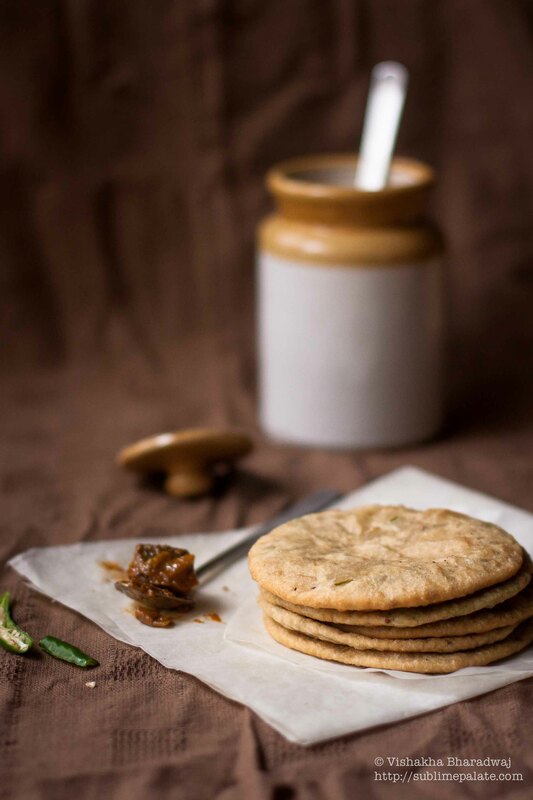 Today, I am sharing my recipe of a traditional Bengali Brunch – ‘Koraishootir Kochuri’ or Pooris stuffed with a spicy peas masala. Do not confuse them with “Kachori” from North India. 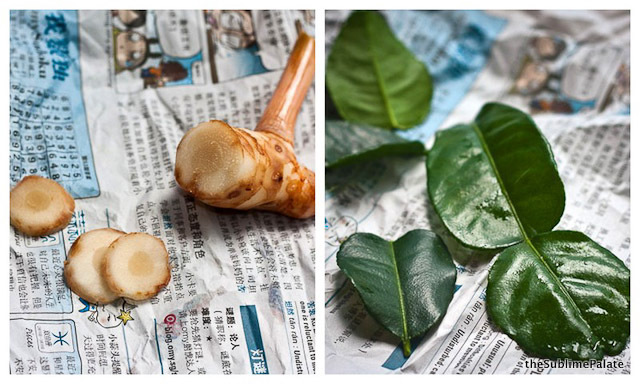 The two are quite different in texture, appearance and taste. 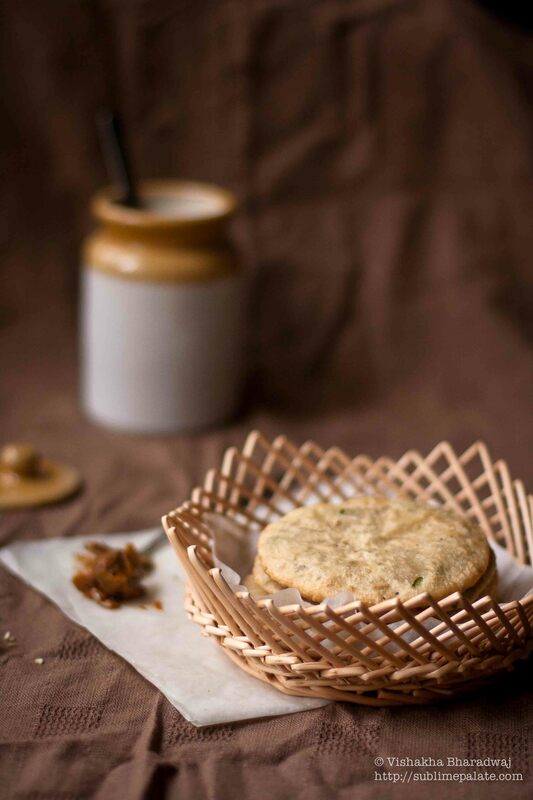 Koraishootir kochuri is a popular homemade breakfast especially in the winter months when peas are in season. I didn’t have to wait for winters as I used frozen peas which are fortunately available year round! 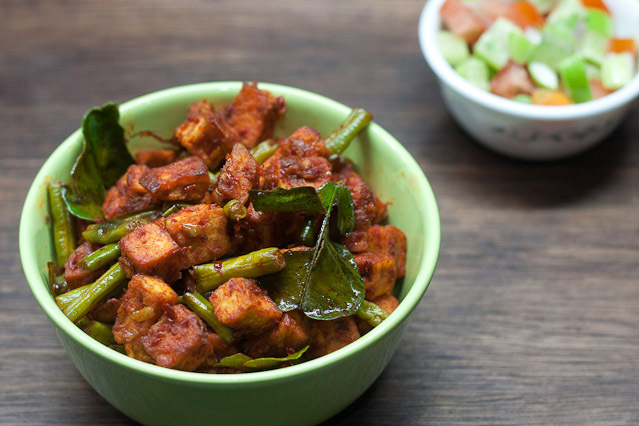 😉 Koraishootir Kochuri is almost always served with some Indian pickles (aachhaar / achaar) and a spicy semi-dry dish made with potatoes called aaloo dom in Bengali or aaloo dum in Hindi. 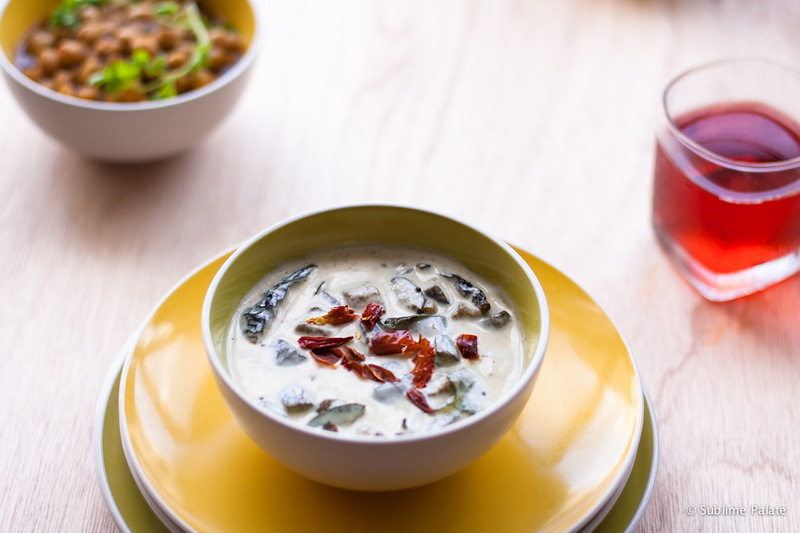 I promise to share a recipe of aaloo dom / aaloo dum very soon! 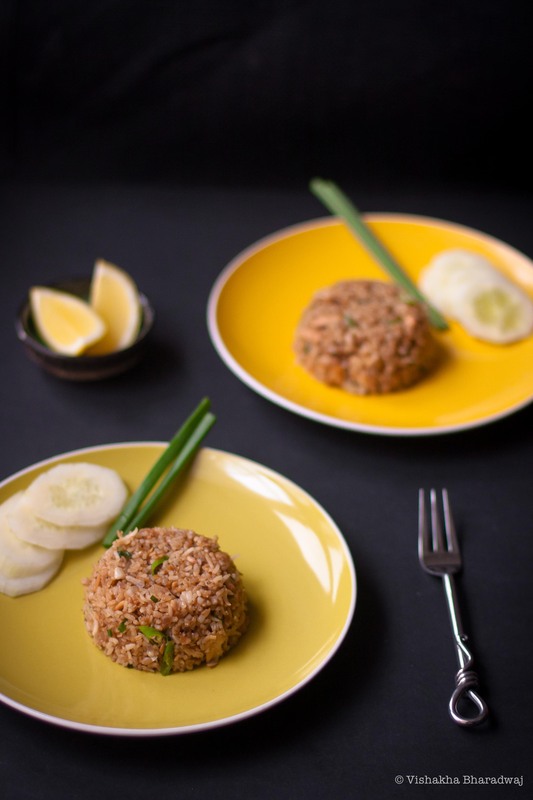 The filling used here is a spicy mixture of peas dominantly flavoured by asafetida. Asafetida or hing, is a very strong and pungent spice. It is used quite extensively in a lot of Indian vegetarian dishes, especially for cooking where no onions or garlic are used. Most commonly available in a powder form, when fried for a few seconds in oil, it releases a very pleasant aroma and enhances the flavour of a dish immediately. A little goes a long way is apt for this spice. It is also an essential ingredient for flavoring many Indian pickles / achaar / aachaar. Traditionally, Maida or refined flour is used to make this dish. I prefer to use wholewheat flour instead. These are quite heavy as they are thicker than the usual pooris and they have filling inside. A Paraath or a huge plate which is common in most Indian homes. It is used to knead dough. A deep bottomed kadhai or Indian style wok or a deep pot for deep frying. 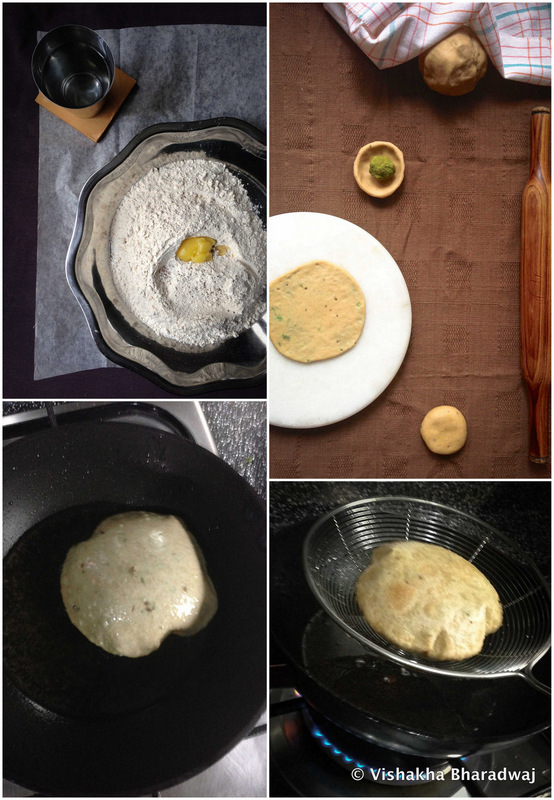 For more information on the essential utensils for an Indian kitchen, you should check out the blog written by my friend, Nisha. She blogs at Spusht and has done a brilliant job of making an inventory for any one new to Indian cooking. Check this and many other interesting recipes and ideas on her blog, Spusht. In a paraath or a big flat deep plate used in most Indian homes for kneading dough, add the flour, carom seeds (ajwain) and salt. 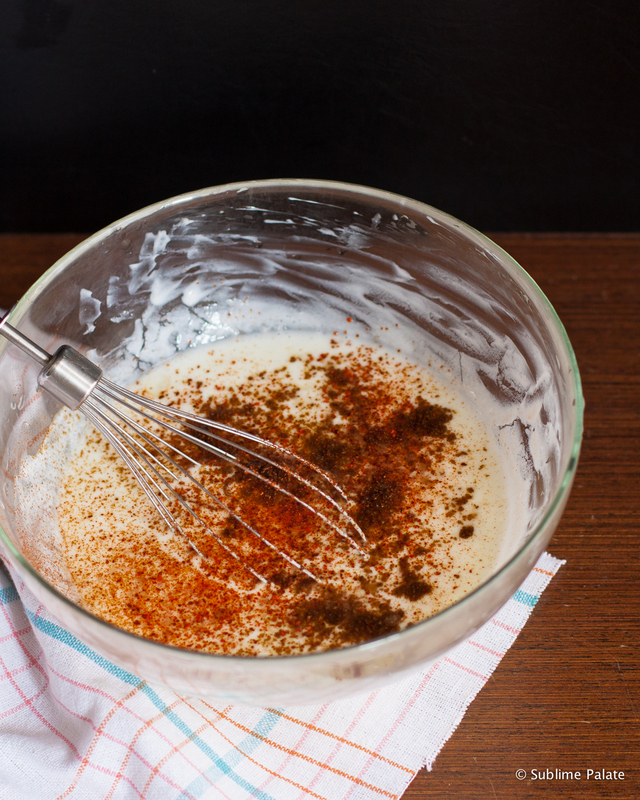 Using your hands mix all the dry ingredients so that they are uniformly spread. Now add ghee (at room temperature) to the flour and rub it in between your palms. Repeatedly rub the flour and ghee mixture in this manner for 3-4 minutes to have the smell and flavour of ghee spread across the flour. Next, make a well and add 1/3 cup water in the middle. Knead the dough mixing the flour with the water, adding water a little at a time. You may not need to use all the water but Add another 1/3 cup warm water and continue kneading. If the dough is sticky, just add a little flour and knead it again until smooth. We are looking for a dough which is not too firm but not very soft either – somewhere in between! 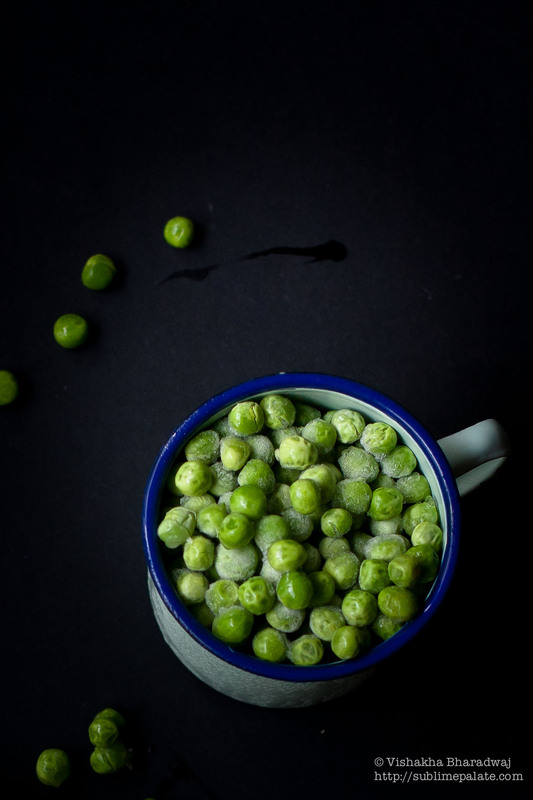 Boil the peas in just enough water to wet the peas with a pinch of salt until they are soft. (About 5 mins). Using a food processor, make a coarse paste of the peas. Heat 2 tsp of oil in a small kadhai / wok / skillet. 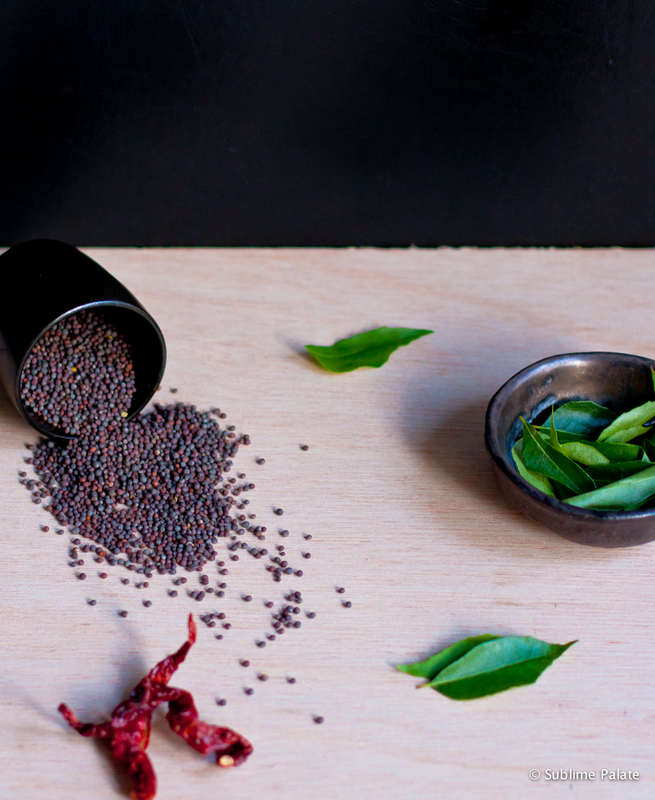 Add cumin seeds, reduce heat and let it change colour without burning or turning black. Add grated ginger. You have to be careful to not let the cumin seeds burn otherwise it can add a bitter taste. Reduce heat or remove the pan from heat if needed. Add the asafetida and stir for a couple of seconds. Add the coarse peas paste, chilli powder and salt to taste. Increase heat to medium, and continue to stir in order to reduce the moisture content of this mixture. When the mixture is almost dry (about 5 mins), add the roasted cumin powder, garam masala powder and aamchoor powder. Taste and adjust the taste to your liking. Continue frying for another 2 minutes and remove from heat. Spread mixture on a plate to allow it to cool completely. 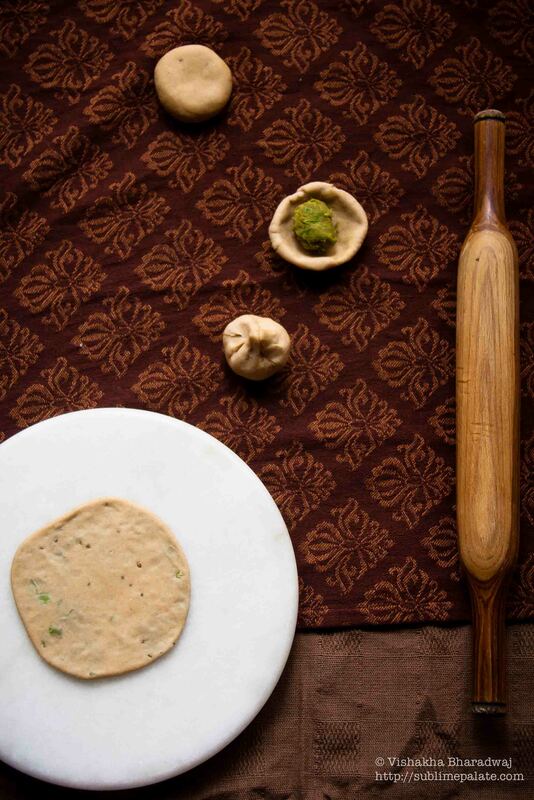 This step is important to help you roll the pooris and make sure the filling doesn’t come out when rolling. Now divide the dough into about equal size pieces. You should be able to make around 18 – 20 pcs. These are rolled thicker than the usual pooris so each portion must be a little bigger than your usual Poori dough. To give you an idea, each pc weighed in between 20-25 gms. Make a smooth ball with each pc of dough. Using your fingers and in a sort of pinching motion, press from the centre turning it around, creating a well to stuff the filling. Make sure you don’t spread it too thin as this needs to be rolled flat and the stuffing should not come out. Stuff around 1 tbsp of the prepared filling as shown in the picture. Seal it well. 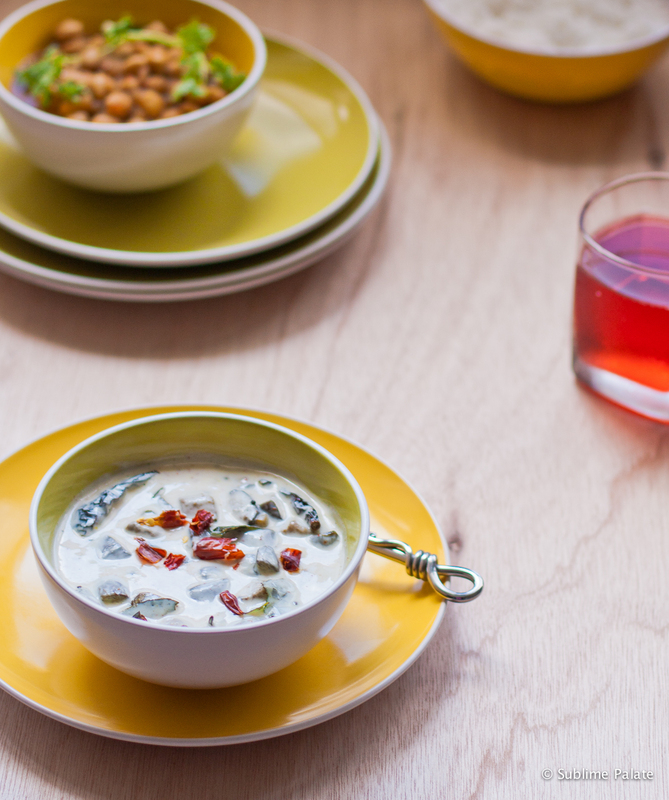 Take out a tbsp of the oil in a small bowl. 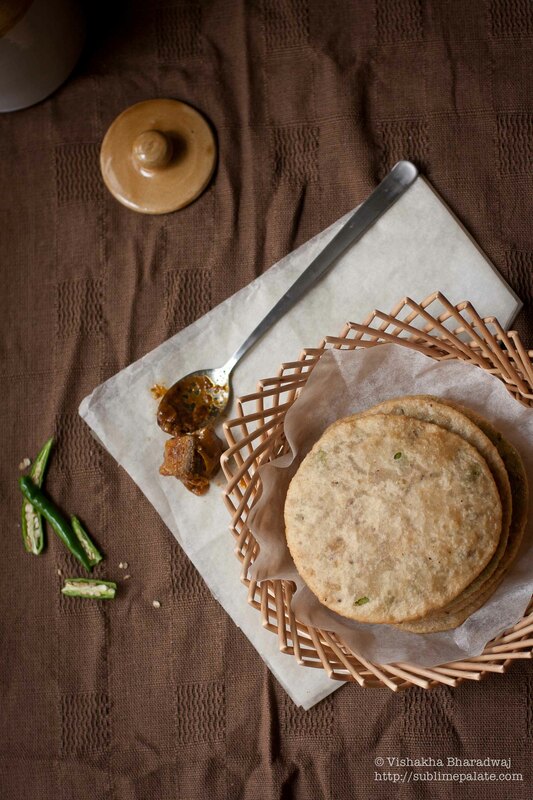 Put a few drops of oil on the surface of the rolling surface (Chakla) to ensure it doesn’t stick when rolling. We do not use flour to roll these as dry flour will burn very quickly [A tip I learned from my Mother-in-law]. Test the oil by adding a tiny pinch of dough, it should sizzle immediately and float up in the oil. Remove the test piece or you’ll have a burnt piece of dough floating about. Gently slide down the rolled koraishootir kochuri in to hot oil to deep fry them. With the back of the spatula, gently press these kochuris to help them fluff up. Once fluffed up, immediately turn them over so that both sides get cooked. Fry one piece at a time. You could roll a few and keep on standby while the oil is heating, but make sure you do not stack them. Instead, spread them on a plate separate from one another. – reduce the heat or remove from heat to gradually cool down the oil to bring to desired temperature. – Add more oil. This will help to reduce the temperature of the oil. Thailand, a country full of little family-owned café’s. These little café’s are usually set in a comforting, home-style environment. Here you’ll experience what I call ‘cooking in the backyard’. It is also how a lot of traditional homes are designed with a wet kitchen in the backyard. You’ll often see the young school going teenager lending a helping hand to his or her parents. During rush hour, the kids even help with the cooking. It’s inspiring to see these young chefs cook with such exuberating confidence. I stand there watching, as the man on my side of the counter passes a white slip over to the Cook. The Cook, a lady probably in her late 40s, has a very pleasant disposition. She smiles at me as she gently heats up the wok while taking a quick glance at the white slip of paper. She’s probably done it a thousand times over and over again. She looks like she could do this with her eyes closed. As the wok heats up, she takes some garlic and chillies and gently pounds them using a mortar and pestle. The mortar and pestle is always by her side. She is extremely organised with each ingredient placed less than an arms distance away, just where it should be. She always has a big icebox next to her where all the chilled meat is kept. She opens it just a bit, takes out the required portion of the meat and closes it again until the next order comes in. An artist in her own right, she knows how to play with her tools – the mortar and pestle, the wok, the ladle and the fire. She uses the fish sauce, sugar, soya sauce, pepper and other herbs and spices to tell her story. She fires up the wok, turning and tossing the ingredients, adding them one after the other, all in good time, adjusting the heat as she deems appropriate. 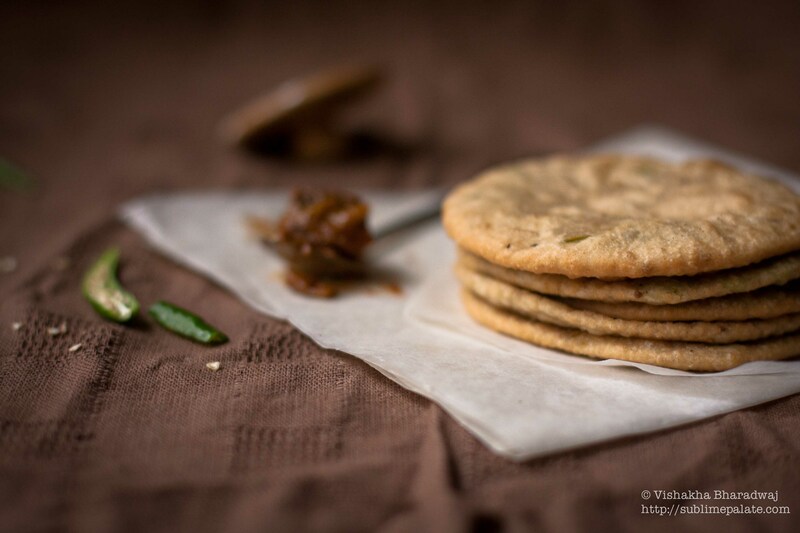 Within minutes, she creates food that is a treat to all your senses. A modest melamine plate in basic white, with or without patterns is placed right next to her. She plates her food and places a few slices of cucumber and a slice of lime, all in such an artistic manner. As the plate makes its journey from the wok to my table, my eyes see the color coordination including the Thai green chillies and the freshness of the lime. As it is placed in front of me, I get the smoky aroma that creates a suspense that I want to unfold, almost immediately. As I take the first bite, I know it has touched all my senses and a memory has just been formed. As the lady moves on to the next white slip where the orders are scribbled, a quick rinse and a scrub is all it takes to have her Wok ready to create the same brilliance all over again for the next waiting customer. 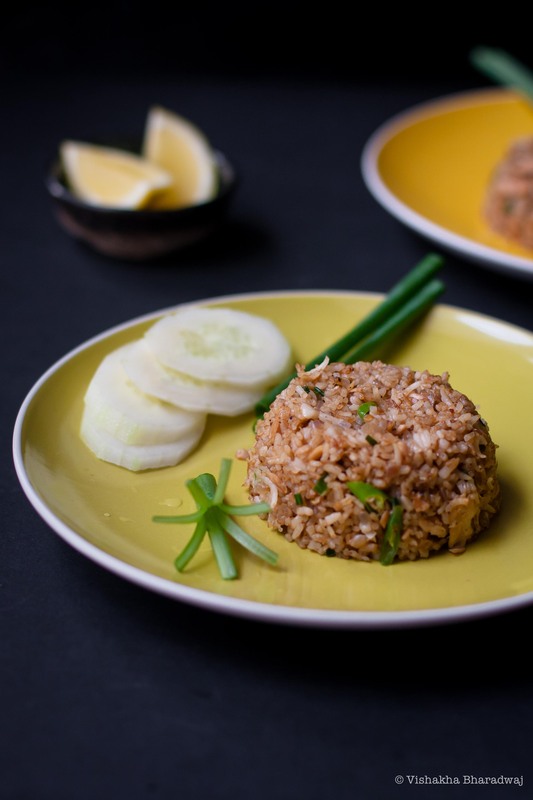 Here is my version of a Thai style Tuna Fried Rice, a dish I had for many lunches during the years that I lived in Thailand. 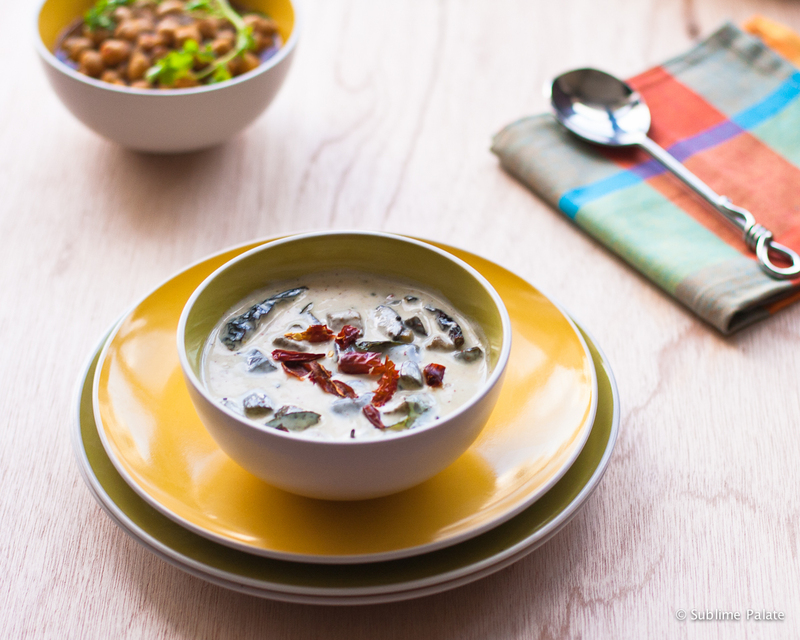 For the printed recipe, click here. Canned Tuna flakes in EVOO (use any other similar variety): 150 gms, oil drained. The rice needs to be precooked and cold. 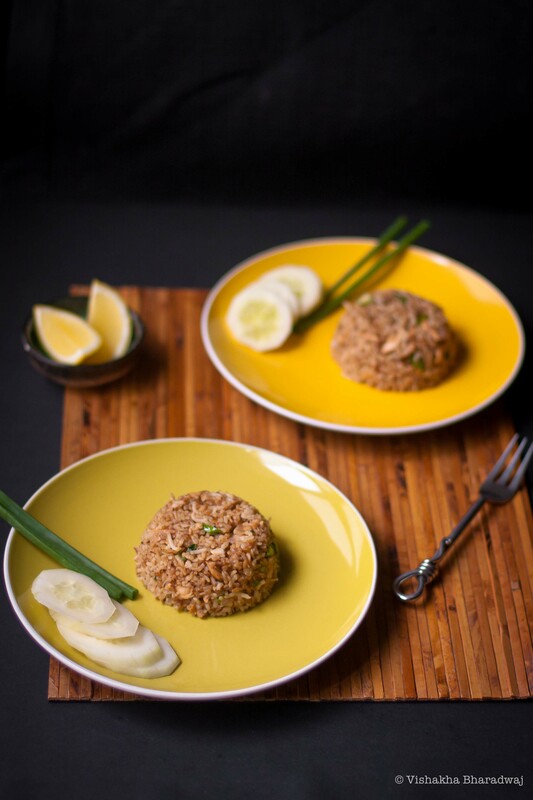 This is important to ensure the grains of rice are separate and not lumpy when making the fried rice. When cooking the rice for fried rice, put a little less water than you would do normally. Heat a wok. When the wok is hot, add oil to it. Add the lightly pounded garlic. Reduce the fire and let the garlic cook for a few seconds without getting burnt. Add the chopped onions and green chillies. Let it soften while stirring continuously. Onions will change colour to a beautiful pink. Approx 3 mins on low heat. When the onions turn pink, add the cold and precooked rice and a tiny pinch of salt and increase the heat to high. Using the back of a ladle/spatula, push the rice towards the centre of the wok, removing any lumps while mixing it with the onions. Now add the tuna followed by all the sauces and the black pepper powder. Bring it together on high heat. Add the chopped spring onions. Give it one last good stir and serve it immediately with some sliced cucumbers and wedges of lime. – Fish sauce is quite salty. I would suggest that you add half the quantity of fish sauce first and adjust the taste as per your liking. 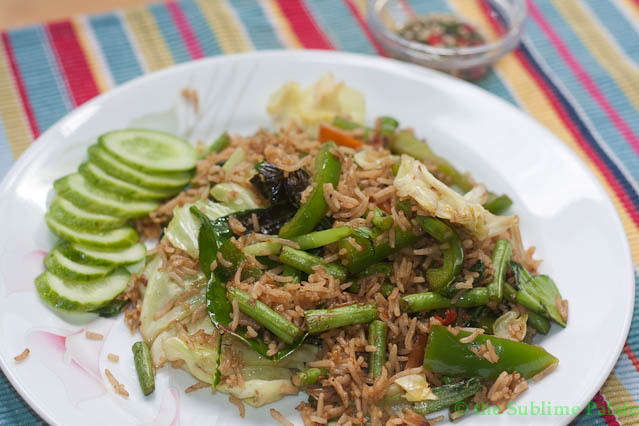 – In my opinion, a fried rice cannot have the same texture and taste if it’s cooked with freshly cooked or hot rice. 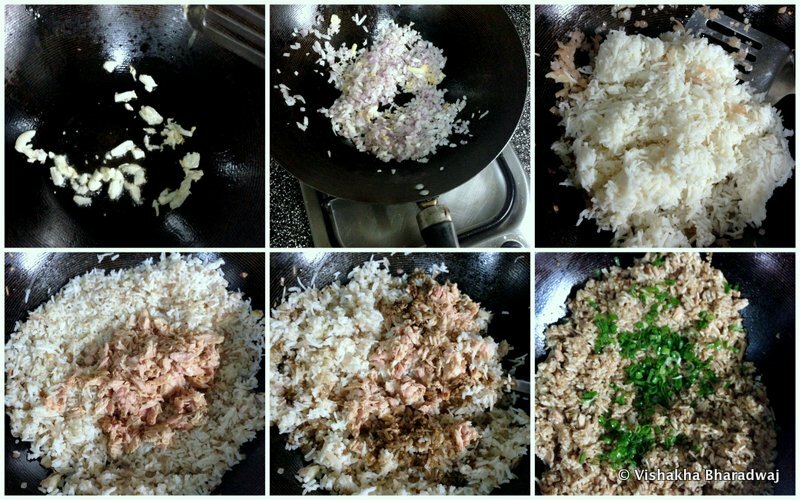 Therefore, try to cook the rice at least a few hours in advance. 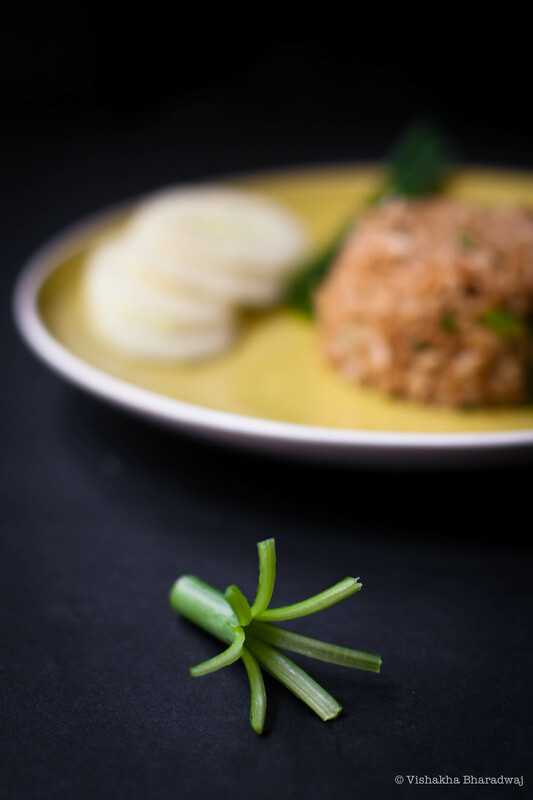 – If you don’t have spring onions, replace it with some finely chopped fresh coriander leaves or cilantro. 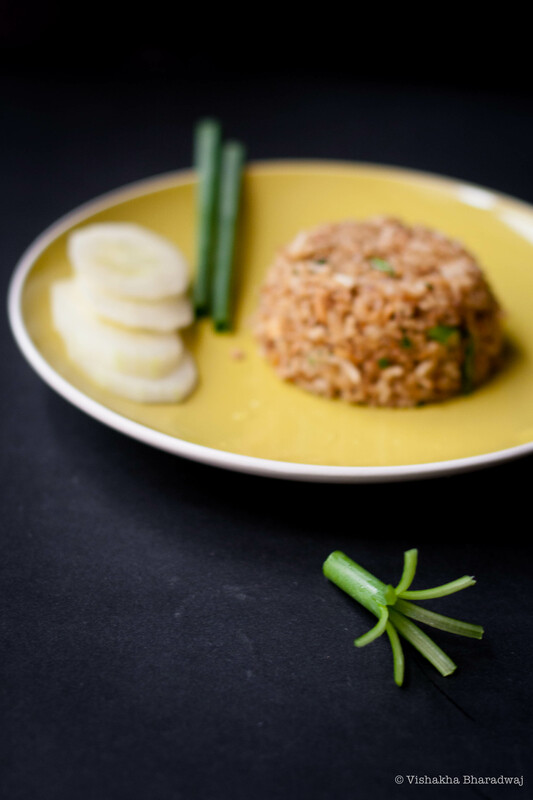 That little bit of green is essential to provide a little freshness to this simple fried rice. 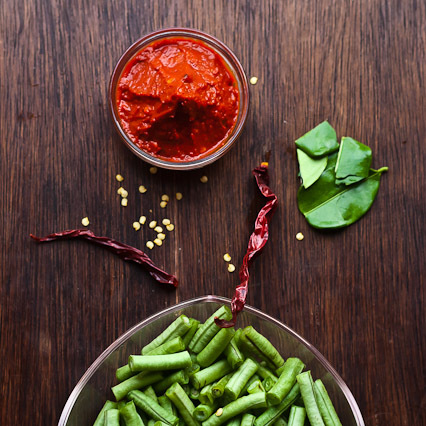 – I had to cook for my 4 year old son, so I added the green chillies right in the end. If not, I would have added them together with the onions, or lightly pound them together with the garlic in the very beginning. Go ahead and do whatever suits your situation. 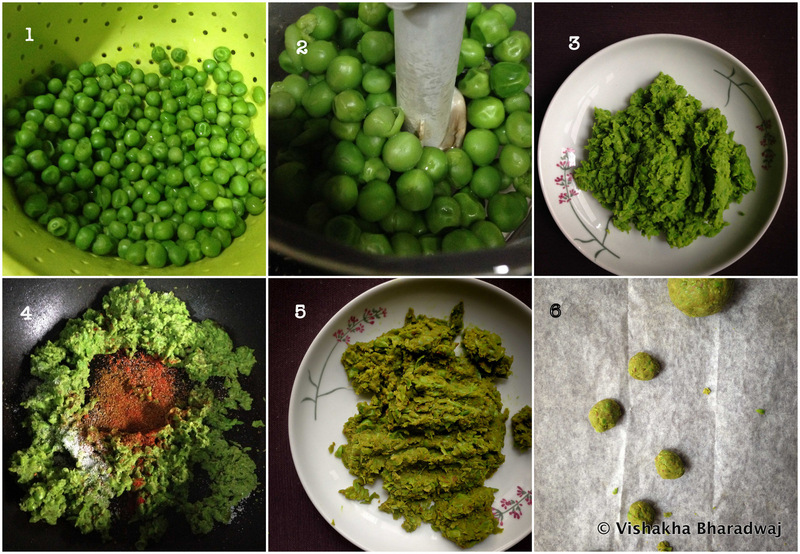 If you are making this for kids, omit the green chillies. You may or may not need the above items – I did. 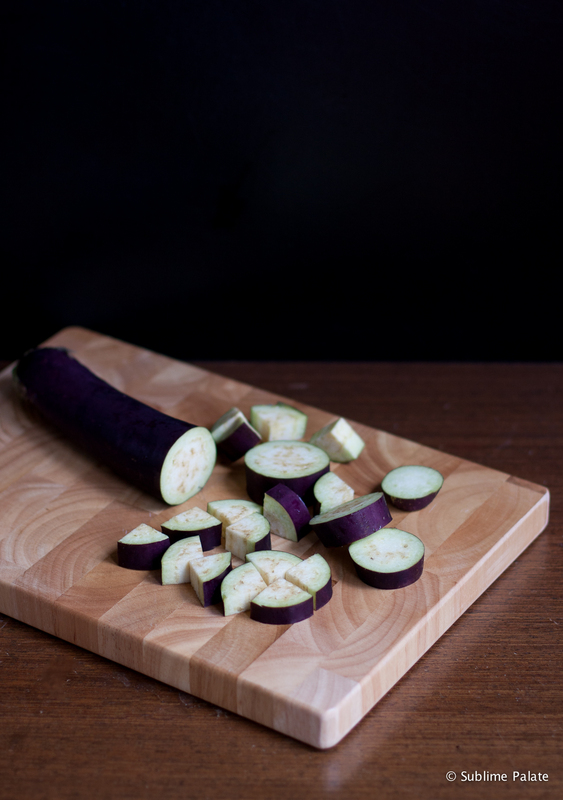 At first, I struggled to find the right spot to photograph my ingredients. Just when I thought I sorted that one out, V dashed in super excited looking at all the food and equipment and wanted to help (they always want to help!). He was tasked to peel garlic. Instantly, he loved the task he was assigned. He felt like a grown up. He was proud to help me as if I had bestowed upon him, the biggest responsibility of his lifetime. He got on with the task which meant, I got on with mine. To my surprise, he did a pretty neat job with the garlic! I made some progress with the tofu dish. I was satisfied. If only, 2 and half year olds could sustain their happiness by peeling garlic! My happiness was short-lived. When we started cooking, little did I know that I was just going to witness a tantrum that will become worthy of an honorable post on my blog. I washed my hands to start cooking. V saw me. Of course, he wanted to do it too! Under normal circumstances, I would carry him to ‘make him taller’ and let him wash his hands by himself. I really wanted to get on with the cooking, so I put a stool for him to stand on and wash his own hands with the expectation that he would be engaged in his own little venture for some time. 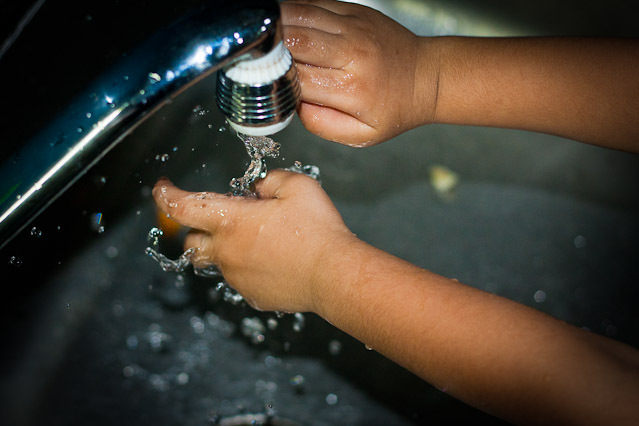 Ten minutes later, he still wanted to wash his hands! 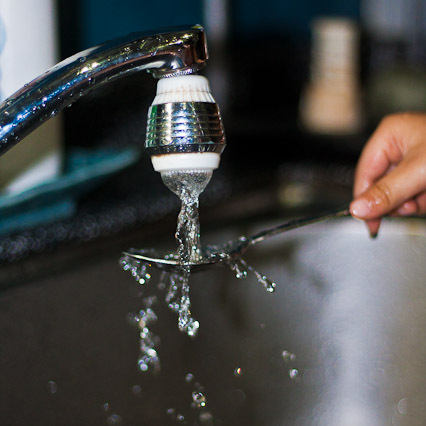 I explained that we should not waste water (logic usually works!). I attempted to distract him. I tried to entice him with his bath toys and all the fun he could possibly have in the bath. Nothing worked! He was focused. Like most kids his age, he knew what he wanted! What followed was a 1-hour episode that resulted in leaking underpants and a pee trail that went from the living room to the bedroom. Thankfully, the kitchen was spared. In the end, I lifted him up and took him to the shower. I thought that could help because honestly, nothing was helping. Instead, he got more agitated. His tantrums peaked. He was uncontrollable. I reminded myself constantly of that one single virtue every parent should have, patience. I poured water on his head against his will in the hope that it will cool him down. Suddenly, there was silence as the water splashed on his head, straightening his hair, running through his eyes and face. He looked calm and he was not crying. What seemed like a never-ending ordeal had finally come to an end. I could finally get back to making and clicking my Spicy Tofu cubes. Our helper, D, makes this Indonesian/Malay recipe. This is my version of it. D usually deep fries the tofu and I have a natural aversion for anything deep fried in my regular cooking. In addition, it makes the tofu cubes lose all the moisture from inside. So, my version has stir fried Tofu / Paneer. (Alternatively, you could use Paneer and follow the same recipe. I make it interchangeably and it works just fine). Cut the dried red chillies into 2. Shake it off so that the seeds come out. Throw the seeds away. Add hot water enough to soak the red chillies and microwave it for 15 seconds. You can also soak it in hot water for 10 minutes. This will soften the dried red chillies. Now wash the chillies under running water gently rubbing it and removing any seeds you can. This step is important to ensure that the chilli paste does not become overly spicy. There are many varieties of Tofu available in the market. Use the “firm” tofu to make this dish. If you use tofu that is soft or silk tofu, the tofu will crumble. If you do not have tofu and assuming you have paneer (or Indian home made cheese), use that instead. 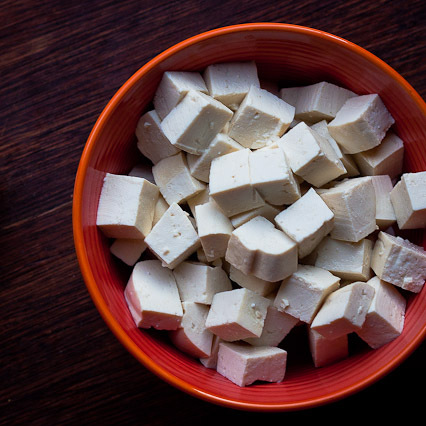 Cut the tofu / paneer into 1” cubes. Rub some salt on this Tofu and keep aside. Pound garlic using a mortar and pestle. Heat 2 tbsp of oil in a non-stick pan. 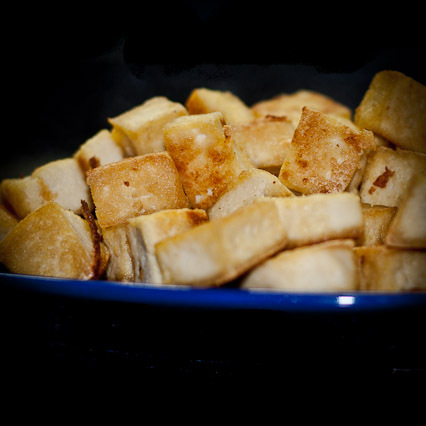 Add the tofu cubes and lightly fry it until gets a light brownish color. Keep aside. Heat oil in a heavy bottomed pan. Add the pound garlic. Stir fry for 30 seconds on low heat. Add the sliced onions and sugar. Soften the onions on medium heat stirring frequently (approx. 5 mins). Add the chilli paste (about 3 tbsp) and salt. Cook the chilli paste on slow heat until the oil separates. This may take up to 10 mins. Once done, add the Galangal to this mix. Stir for another 2 mins. Add 1/3 cup water to moisten this paste. Next, add the long beans and cook it on medium heat stirring occasionally. If it is dry, add some more water (3 – 4 tbsp). Remember that the long beans should be crunchy and not overcooked. 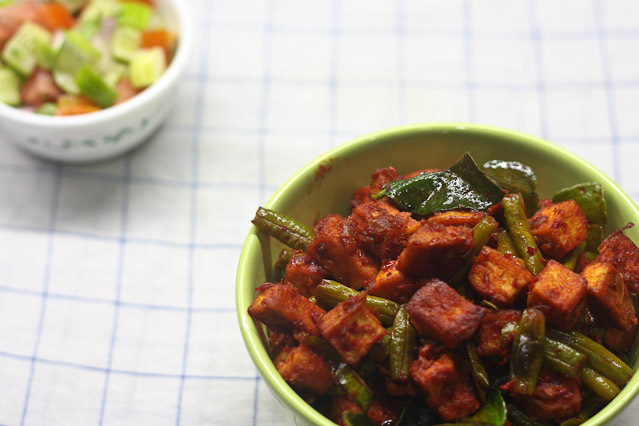 Now add the pan fried tofu / paneer cubes along with the torn kaffir lime leaves. 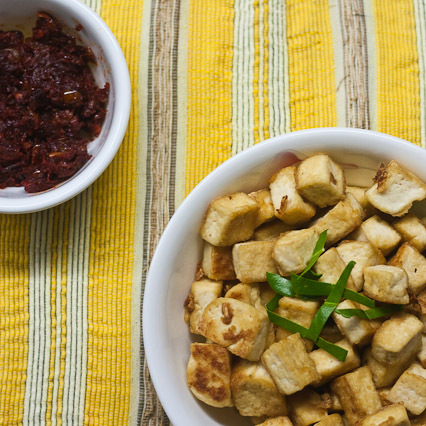 Combine everything together to ensure that the tofu / paneer is uniformly coated with the chilli paste. Stir for another 5 minutes on low heat. Serve with rice. As this dish is high on heat, I prefer to have something cooling along with it like mix vegetable clear soup and an everyday cucumber/tomato light salad.